Crikey it is very zoomed in, it makes me dizzy! Though if you wait, it gets better when they get to the camera mounted on the front of the car. 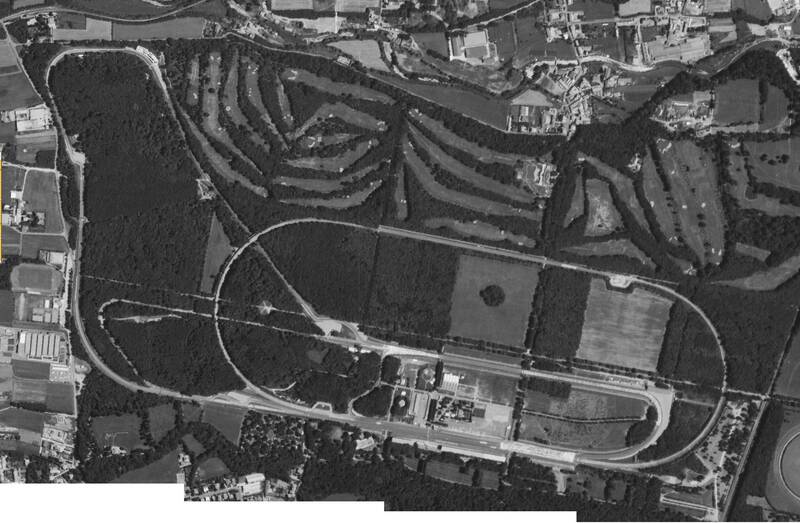 In fact before the von trips / clark incident, the grassy mound extended all the way around parabolica and there was no sand / gravel trap (not sure which it was in those days). It is amazing the difference all these little changes make to the feel of a circuit. That is why things like the mexico and zandvoort 65 - 69 historical updates are so interesting. Well, it is actually quite wrong, as Ginetto said. (i posted about it in this topic, starting here http://srmz.net/inde...=20#entry120942 but sadly the images i uploaded to postimg seem to have gone. Looks like i'll be using imgur now unless anyone knows any better alternatives). Although the picture is from 88, curva grande and the lesmos are still unchanged (apart from the run-off etc obviously) and della roggia gives an idea of how it would have been as the chicane hasn't been moved yet - I imagine it would have kinked left following the line of trees. Vialone is harder to map. But i do agree with you a lot about old tracks being vastly superior - especially pre 1970 or so, when the changes really started to come into force. Pre 80 at a push. Bike racing stayed with great circuits for much longer than cars, and of course circuits that were only run in national or club championships were saved until much later - 80s or 90s was when they tended to be ruined. And that's forgetting that the most interesting circuits of all were the road circuits themselves! When was it that italy outlawed road racing? I have a feeling it was after le mans 55 but then maybe that was only for cars as I know bikes did non-championship road racing events. Maybe it was just they started to wind it down then? Or were there other incidents that caused the ban? Sadly there were never really road races in england as far as i know, but on the plus side, at least the national circuits are still quite interesting if you ignore the monstrosities of modern silverstone and snetterton. Anyway it's not people here you need to convince about old circuits - try telling them over a race department where all they care about is modern f1 and gt3. They were actually surprised when reiza's imola 72 turned out to be the best layout of the versions reiza released. Edited by one2fwee, Apr 04 2019 - 01:14 AM. Oh wow that's cool i hadn't seen that thanks! To be honest, what i'm largely curious about is how it was pre-war. I wonder if any aerial photos of that exist anywhere. I hear lesmo 1 was different but i'm not actually sure. In fact certain sites seem to say it was different until 1955 - i can't tell from these small slides but it looks pretty much the same. They also seem to suggest vialone was tightened in 55 too, but from what i can see from what you posted it seemed to always follow the tree-line? I guess it's hard to tell from these aerials. Can't remember where this came from.... so not sure how correct it is. Shows pre-war layouts (but not in any detail). Yes, I am sure on that. By using the same setup in the original Papy version and the 10k track I feel no difference by entering and leaving the high speed curves and the slower ones like the Lesmos or the Parabolica, provided that speed and the temperature of the engine and the tires are similar. But: not all setups which are appropriate to manage the standard Monza lap are equally appropriate for the 10k derivative. Personally I prefer a combination of a stiff differential setup (s.th. like 85/30, 6 clutches) combined with a negative toe-in at the front suspension (-0,127 degree) for the original Papyrus Monza track to keep speed high in the fast bents (especially curva grande and Viallone). In combination with my (limited) driving skills this works for more or less all cars of the 67mod. Driving the Eagle, the Ferrari, the Brabham or the Cooper these setups are also convenient setups to me for the 10k track. No problem entering the bankings full throttle with >310 km/h. Taking the oval with maximum speed is unavoidable for good lap times since the oval represents half of the distance and you will not catch up enough time in the rest of the track when you loose time in the oval by reducing speed. But this kind of setup does not work for the heavier cars which tend to oversteer like the Honda or the BRM. Entering the banking at top speed with such a differential gear setup results inevitably in a spin of the car. For these two heavy oversteering cars I need a differential gear setup like 45/30 – 6 clutches. 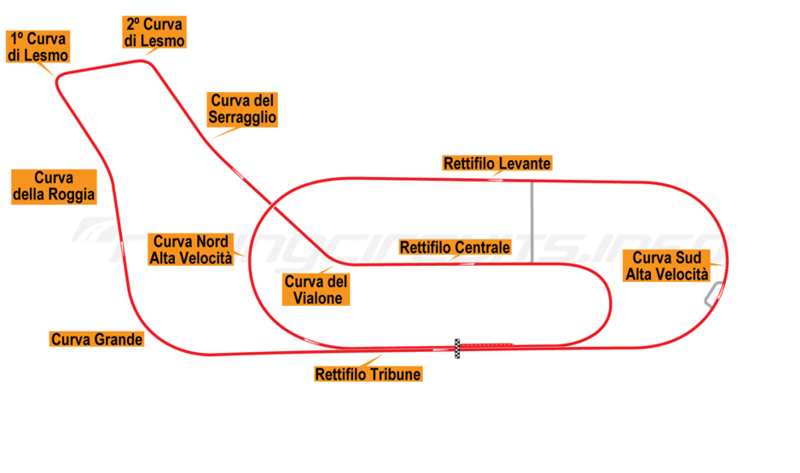 But of course then the behavior of the cars in the Viallone or the curva grande is completely different – less favorable. 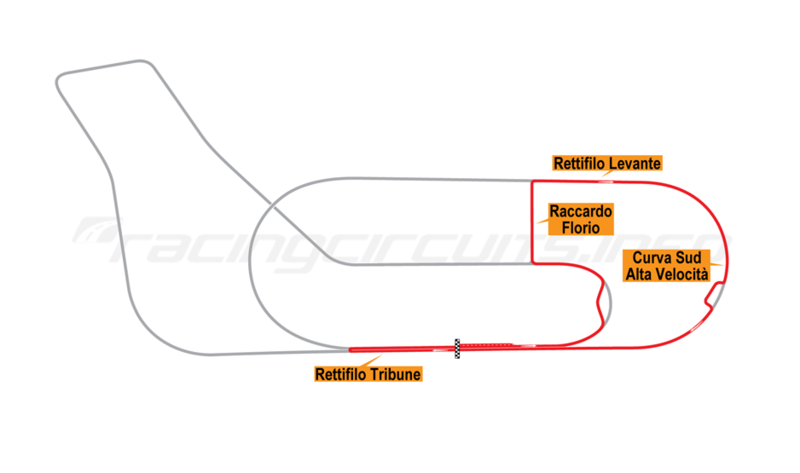 So I would not uses such a setup for the standard Version of the Monza track. Thanks webfoot, yes I have seen those before. I meant more aerial photos from the period, as track maps don't tell the full story. Corner photos would be good also. Mainly I am curious about the original semi-circular turn (i don't know what it was called). From what I can guess, the original back straight is the tree-lined road parallel to the back straight of today. Also in some of the old aerial images (the 1950 one especially), you can see where the original south banking was in comparison to the newer one. It also shows vialone being tightened in 55 which i can't see from the satellite but i could be wrong because it's hard to tell. For the "original" first lesmo, it looks to me like it might have been the road slightly off to the left of the lesmo in Ginetto's 75 image - but i might be completely wrong there. I don't even know if the lesmo used to be different! That's the problem with plans and drawings, you never know what to trust or how accurate they are. Edited by one2fwee, Apr 04 2019 - 01:55 PM. "Mainly I am curious about the original semi-circular turn (i don't know what it was called)." The section was called the Vedano Curves. Only that section was paved with bricks. Edited by gliebzeit, Apr 04 2019 - 02:10 PM. But still, it's nice to see information about it as you don't tend to see too much! Aerial photo of Monza Park. Edited by gliebzeit, Apr 04 2019 - 02:29 PM. From the '36 & '38 GPs. Edited by Royale, Apr 04 2019 - 02:54 PM. Oh thanks Gliebzeit. It's funny, i've always thought that photo was a model or a painting because there are no trees and the track stands out so prominently. Those paintings are interesting Royale. I know the original south banking was a lot shallower, but was the north banking originally this shallow too? And it was just increased in 55? (when they built the new south banking slightly further north of the original). The big banking was only build postwar. Originally the oval turns had small banking angle apart from that they where copies of each other.